India's National Television Channel Doordarshan did live telecast of the Swearing-in-Ceremony of Narendra Modi as the 15th Prime Minister of India. We can watch this completed live youtube video here. The Union Council of Ministers were also taken oath on the occasion which was presided over by President Pranab Mukherjee. This event in the Rashtrapati Bhavan started at around 6.00 P.M IST. Watch this Video to see the highlights of this oath taking ceremony. Around 4,000 guests, including Pakistan Prime Minister Nawaz Sharif and other South Asian leaders, attended this oath ceremony. This is the first time that the heads of states of the South Asian Association for Regional Cooperation (SAARC) have been invited for the oath ceremony of an Indian Prime Minister. 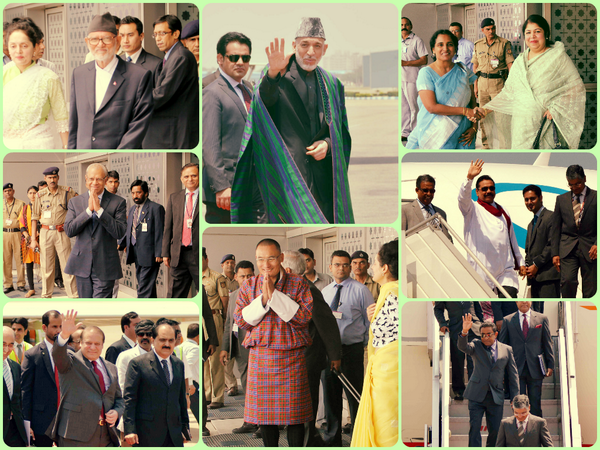 Apart from Pakistan Prime Minister Nawaz Sharif, Sri Lankan President Mahinda Rajapaksa, Afghanistan President Hamid Karzai, Bhutan Prime Minister Tshering Tobgay, Nepal Prime Minister Sushil Koirala and Maldivian President Abdulla Yameen Abdul Gayoom are also attending the event. Anil Ambani, Sunil Mittal, Prashant Ruia, Gautam Adani, Pawan Munjal and AM Naik will be among the 4,000 people expected to attend the grand celebrations. Tamil Film Actor Superstar Rajinikanth has decided to skip Narendra Modi's swearing in as Prime Minister. More than 10,000 personnel are deployed for giving security for the Rashtrapati Bhavan during this swearing-in ceremony.